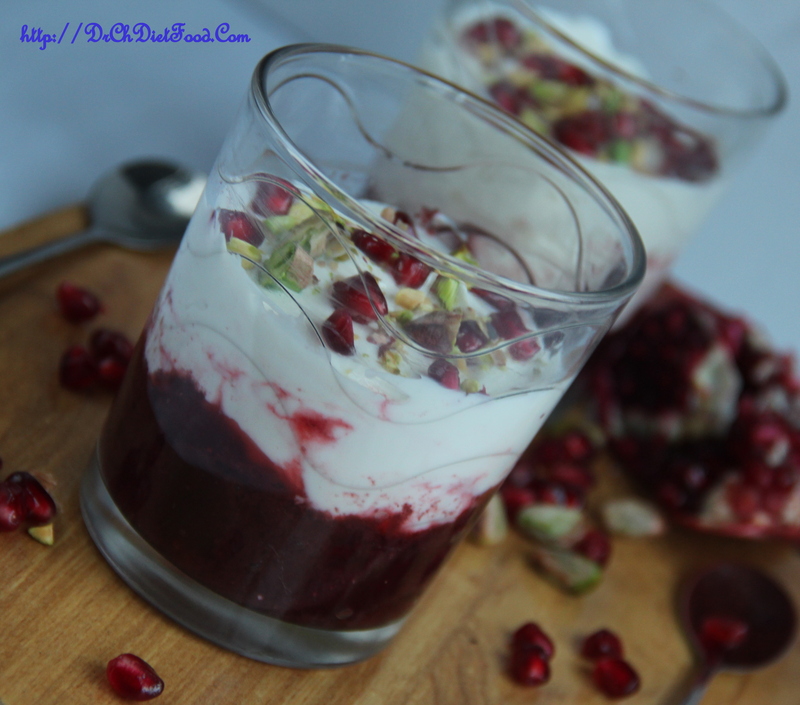 Rich, Creamy yogurt, Vanilla flavored pudding tempers the tart-sweet pomegranate compote. It’s also wonderful as compote to eat for breakfast over Greek yogurt or crepes, or for dessert I love it warm with a little frozen yogurt. Grind briefly the pomegranate seeds in a food processor/blender and transfer to a sieve, press down with back of a spoon to extract the juice, discard the seeds. Dissolve corn starch in 1/4cup water. Turn off the heat and allow it to cool completely. And then refrigerate for 2-3hours until completely set. Put the yogurt, vanilla essence and maple syrup together in a bowl and whisk until well combined. Take two glasses and spoon pomegranate jelly/compote in the bottom of the glass. 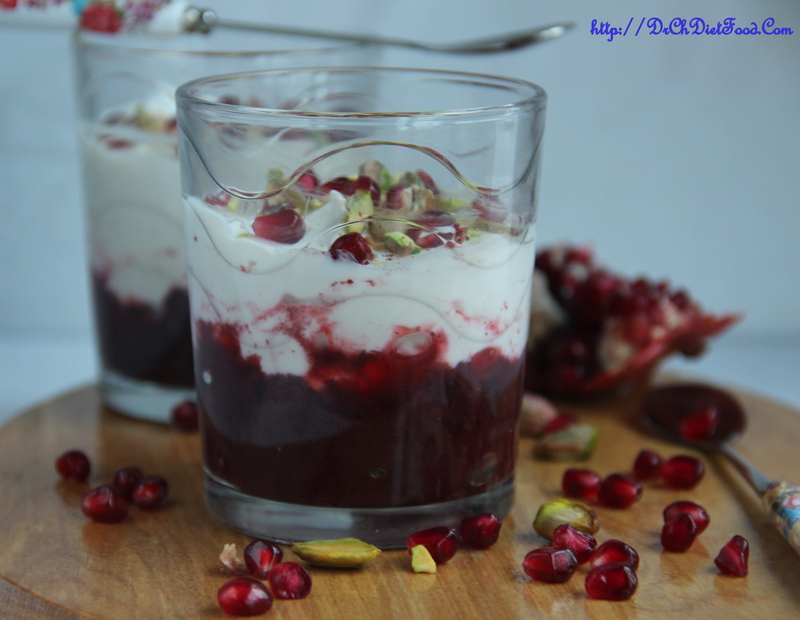 Carefully spoon the yogurt mixture on top of the pomegranate compote. 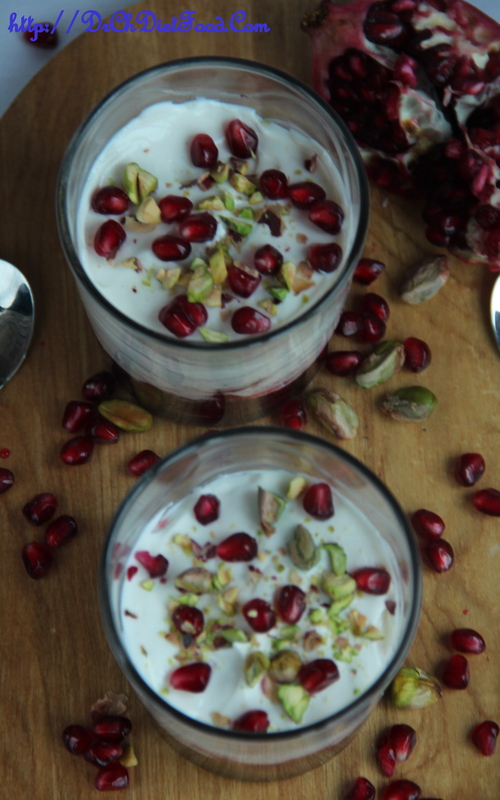 Spoon the pomegranate seeds and pistachio on top. I used corn starch in compote to make it a thicker and help to reduce the boiling time- you can skip corn starch and cook the pomegranate juice for little longer time until it thickens. Honey/maple syrup can be replaced with sugar or any sweetener of choice. I used freshly pressed pomegranate juice – store bought one can also be used. If your yogurt is not thick enough just hung it for 1-2 hours to remove the liquid content from it. 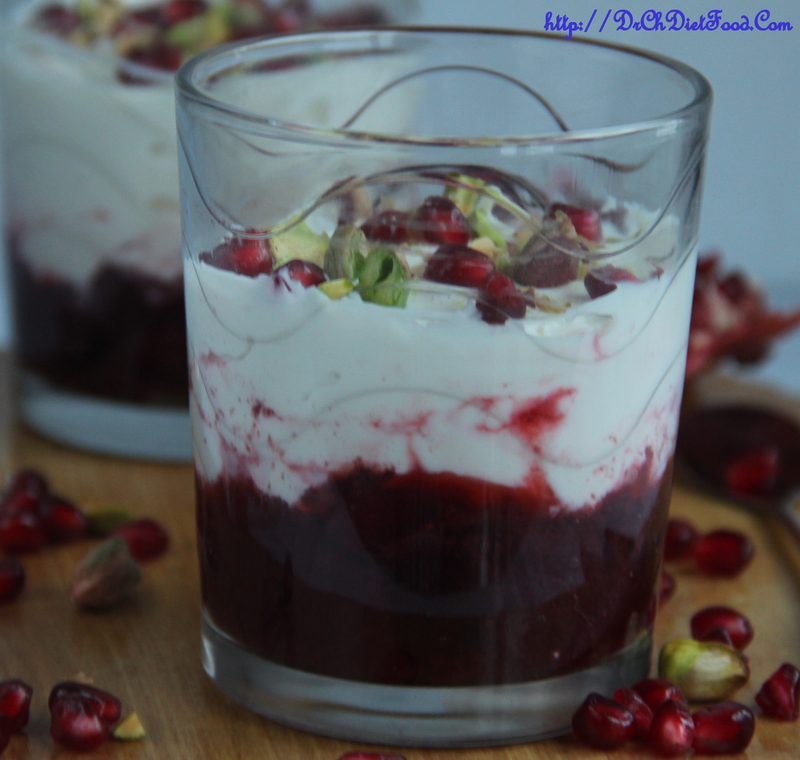 Posted on June 11, 2015, in Breakfast, Breakfast, Dessert, Indian, International, Juices/Beverages, Sweets and tagged Cream free dessert, Greek yogurt fruit compote dessert, low - sugar desserts, pom yogurt desset, pomegranate - yogurt pudding, summer desserts. Bookmark the permalink. 26 Comments. Looks really yummy, Chitra! I love the combination of pistachios and pomegranite seeds. It’s so nice when something so sweet and beautiful is healthy for you too! Thank you Shari… thatz my favorite combo as well, this was delicious indeed..glad you liked it. …. Sounds so delicious, Chitra! And it looks gorgeous too. I love pomegranates so will try this for sure! so nice to hear such creative mind Derrick…Glad to hear your childhood stories…. I wonder can you use pom juice in place of an actual pomegranate.